Being a kid is rough; there’s a whole world out of there, full of a variety of experiences to behold, and everything is brand new. While there is definitely an element of excitement running through all of that, for some kids the fear of the unknown can cripple their ability to enjoy those new experiences to their fullest extent. Written by husband and wife team Leslie and Brian Miller, the Fobie Friends series makes the idea of confronting your fears approachable, and gives kids strategies for facing those challenges in a kid friendly and easy to understand way. The Fobie Friends series currently has three books available, each of which approaches a specific fear. A young child, relatable to the audience, relates their deepest fear and their feelings of powerlessness against it. Then, using the power of their imaginations, they face up to those fears with the help of a sympathetic animal friend who has gone through it themselves. After hearing the animal’s story and getting some tips for confronting those fears, the child then triumphantly steps up to the plate to defeat those fears once and for all. The hardcovers books use a familiar storybook format to approach the idea of facing your fears in a non-threatening way. The illustrations are colorful and engaging, and the kids are very imaginative as they think about their problems. 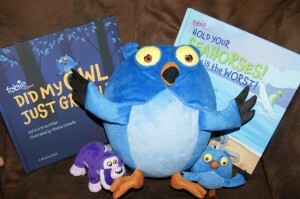 In addition, the books come along with a mini animal friend that matches the one from the book, so the kids can take a little bit of courage along with them wherever they go. The five, seven, and nine year old that I had check them out with me adored the animal friends on sight, and having a little something they can hook on their backpack or hide in their pocket when they get scared is a perfect way to help them remember their strategies for being brave. In “Hold Your Seahorses! Water Is The Worst!”, a young girl faces up to her fear of water with the help of a friendly seahorse. In “Did My Owl Just Growl?”, a young gentleman who is terribly afraid of the dark finds a cute purple owl to face the darkness with. “Clim the Monkey Bars? That’s Bananas!” helps a little guy works through his fear of heights with a wise old gorilla who once feared the high branches himself. These are a really good sampling of the most common fears of young children, but the series promises to roll out books featuring things such as bullying and the dentist in the future. Each of the books uses a couple of the same rhyming catchphrases, making them easy to remember in a stressful situation. “One step at a time is the goal you must choose. Relax and have fun, there is nothing to lose.” The words and phrasing are really perfectly suited to young children, and the animal friends are the crowning touch. When I asked the five year old what her favorite part of Fobie Friends was, she immediately cried out, “Everything!” High praise indeed. Fobie Friends is a friendly approach to dealing with fears, and a great resource for parents of anxious children. By approaching the idea of facing up to those fears in a nonthreatening way, kids can work up the bravery to try it themselves with the help of adorable little plushies and some easy to remember coping strategies.